Can you imagine Lara at 83? Computer Gaming World did and travelled to 2050 to interview her. The result was rather strange. Was she crying for her lost youth? Don't think so. You better check out for yourself. More info on Tomb Raider Gold. Available in France, but you can get it on-line. A new desktop theme available. The latest news on Tomb Raider Gold. The assault course top 20 times. Yet another version of the Tomb Raider/Witchblade comic book. This time we've won the prestigious Eye Candy Award! Our favorite heroine and adventurer just turn 31. A new cartoon every week! Your place in The Croft Times. Who do you think is the best actress to play Lara on the Tomb Raider movie? Find them here. read them... Tomb Explorer, the browser for the Tomb Raider fan. get it... Comments? Suggestions? Questions? Write us. write us... Subscribe to our free newsletter. Lara Croft. Can't finish the game? Check here. Patches and levels. of Lara Croft. Meet the CORE team. Graphics, sounds, videos and desktop theme. The Crofts are everywhere. More about the Crofts. 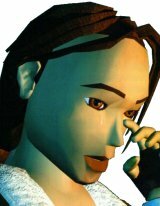 "The Croft Times" is an unofficial site dedicated to the Tomb Raider game. Tomb Raider was developed by Core Design Ltd and is property of Eidos Interactive. Neither Core nor Eidos have any association with The Croft Times. The Croft Times Tomb Explorer is a special customized version of Microsoft® Internet Explorer. Active Channel and the Microsoft Internet Explorer logo are trademarks of Microsoft Corporation in the United States and/or other countries. Please note that The Croft Times is being edited from Portugal. We ask your indulgence for any flaw in the writing, and please, PLEASE, correct us! CUBE Tecnologias de Informação, Lda.